Exchanging molecules from the bloodstream to tissues forms the basis of life, delivering nutrients and carrying waste products to be disposed of. This occurs in blood vessels known as capillaries. In this article, we shall look at how molecules move between capillaries and tissues as well as related clinical conditions. The structure of capillaries facilitates efficient exchange, by maximising Fick’s law. Fick’s law states that the rate of diffusion is proportional to the concentration difference and area available for diffusion, whilst being inversely proportional to the diffusion distance. To maximise area available for diffusion, there are many capillaries supplying the same tissue. A constant blood flow through the capillaries maintains a large concentration gradient to allow the molecules to be exchanged with the tissue. Additionally, although a singular capillary has a large resistance, many capillaries in parallel reduces the resistance and allows efficient blood supply to the tissues. Finally, the diffusion distance is minimised as the endothelium of the capillaries is just one cell thick. This enables capillaries to measure only a few micrometres in diameter on average. Small, lipid soluble molecules, such as oxygen and carbon dioxide are able to freely diffuse across the membrane. However, molecules can also be exchanged via specialised channels or pores. The number of such channels or pores can vary depending on the function of the tissue, for example the renal capillary is able to exchange water and electrolytes much more efficiently and selectively than in other capillaries. Fig 1 – Diagram showing the structure of capillary walls. Gas exchange occurs between the terminal portions of the lungs and pulmonary capillaries, and is a vital example of capillary exchange. The pulmonary capillaries optimise diffusion rate by receiving a constant blood supply, having an average membrane thickness of only 0.6 micrometres and forming a network of capillaries over alveoli. Furthermore, the alveoli themselves have an extremely large surface area of seventy square metres to further increase the surface area available for diffusion. However, common diseases can interfere with this optimisation. A useful way of thinking about these diseases is to frame them with respect to the variables of Fick’s law. For example, some pulmonary diseases cause fibrosis or oedema, which increases the diffusion distance that the molecule has to travel. Other diseases, such as emphysema, cause the alveoli to lose their shape and combine, to form a single alveoli which has a smaller surface area than the previous two. Finally, if the lungs are unable to ventilate correctly, such as in restrictive lung diseases, a shallower concentration gradient is established, and diffusion rate is impaired. Blood hydrostatic pressure: the pressure exerted by blood in the capillaries against the capillary wall. This pressure forces fluid out of the capillary. Blood Colloid osmotic pressure: the pressure exerted by proteins in the blood, mostly by albumin in the capillaries. These proteins are normally too large to diffuse into the interstitium, but in certain scenarios, such as in inflammation and pathological circumstances, these proteins can. This pressure is attempting to pull fluid into the blood. Interstitial hydrostatic pressure: the pressure of the fluid in the interstitium. This pressure forces fluid back into the capillary. Interstitial colloid osmotic pressure: the pressure of the proteins in the interstitium. This pressure pulls fluid out of the capillary. Fig 2 – Diagram showing the Starling forces that take place over a capillary bed. Kwashiorkor is a disease caused by severe malnutrition, although protein intake is most significantly effected. Due to the lack of protein intake, the liver will produce less plasma proteins, such as albumin. Therefore, this will decrease the blood colloid osmotic pressure and less fluid will be drawn back into the capillaries and stay in the tissue. This build-up of fluid is a symptom common to many diseases and is known as oedema, which in Kwashiorkor may mask the typical muscle wastage commonly seen in other malnutrition diseases. Hence patients with Kwashiorkor have distended abdomens but thin extremities. 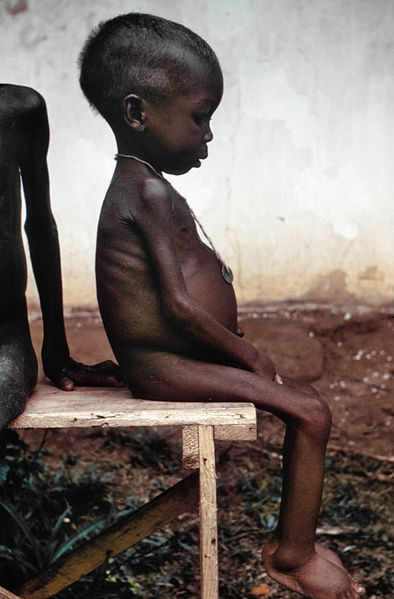 Fig 3.0 – Image showing a child with Kawshiorkor. Inflammation occurs in response to cell injury, and is another mechanism that can be explained in terms of Starling forces. Inflammation stimulates dilation of arterioles and therefore increases the hydrostatic pressure in the capillaries. Additionally, chemicals such as histamine cause the capillaries to become more permeable and allows proteins from the blood to flow into the interstitium, and increase the colloid osmotic force from the interstitum. These two factors both cause an increase of fluid to move out into the interstitum and explains the typical swelling seen in inflamed areas.